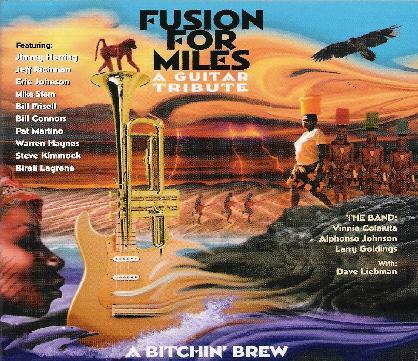 Various Artists - "Fusion for Miles: A Guitar Tribute"
Tone Center has put together two fantastic CDs in tribute to Miles Davis and another to Mahavishnu Orchestra. The backing band who arranged all the music is half the same on both CDs and lead by guitarist Jeff Richman together with Vinnie Colaiuta (Drums), Alphonso Johnson (Bass), Larry Goldings (organ) and Dave Liebmann (Sax). Anyway, they bring in the some of the best guitarist around (outside of the heavy metal genre). The list is impressive and includes Eric Johnson, Warren Haynes, Jimmy Herring, Steve Kimock, Bill Connors, Pat Martino, Mike Stern, Bill Frisell, and Bireli Lagrene. The playing is all incredible and some of the versions would make Miles smile and others perhaps not. Fantastic and great CD.